From Black History Month to Thanksgiving, special events throughout the school year present a number of learning opportunities for students of all ages. Explain the background behind historical events by introducing students to relevant cultures and languages. When teaching the French Revolution, FrenchLanguage worksheets connect students with French culture, just as Spanish provides a deeper connection with the missions of New Spain. 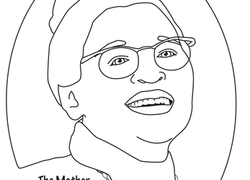 An icon of the Civil Rights Movement, Rosa Parks is featured on this simple coloring page, a perfect way for your child to engage in learning history. A simple coloring page can help teach U.S. history! Introduce your child to Harriet Tubman, an important historical figure from Abolitionist and Civil War era. How many words relating to the Civil Rights Movement can your kid find? This word search is great for boosting both language skills and historical knowledge. George Washington Carver did more than just play around with peanuts all day. He was an educator, a community leader, and a scientist. This Rosa Parks coloring page will give you an opportunity to discuss a brave woman's historic act of defiance with your first grader. In this worksheet, read all about Brown vs. Board of Education, a court decision that changed the lives of millions of Americans. The origin of Valentine's Day is a mystery made up of legends and history. Learn about the possible origin of Valentine's Day in this Venn diagram worksheet. Celebrate Black History Month with a coloring page of Frederick Douglass - a social reformer, writer and eloquent speaker. 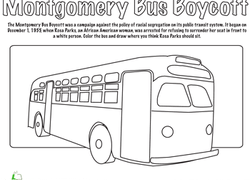 Use this coloring page as an opportunity to discuss the courage of Rosa Parks and the Montgomery Bus Boycott. Learn all about the historic March on Washington in this reading response worksheet. Learn about one of the important figures of American history in this worksheet with a word scramble about Frederick Douglass. Colour in this picture of Sojourner Truth, one of the very first abolitionists and women's rights advocates.